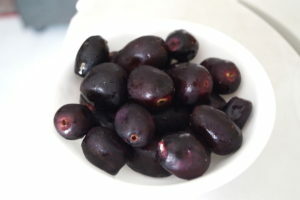 Kala Jamun, or Java plum or black plum is a fruit that grows in South East Asia in the summer and is a superfood. Its health benefits have been touted far and wide but it’s also an acquired taste. Most people I know don’t like it very much and when I was younger, I didn’t either. However, my dietary choices as I grow older are veering more towards foods that have amazing health benefits than those that simply taste good. Jamuns are loaded with nutrients and vitamins. It apparently helps combat a host of diseases such as hypertension, high cholesterol, diabetes, cancer and even improves eyesight. It also helps fix issues of the digestive tract. The deep purple, almost black fruit tastes earthy, mildly tart, sweet and something I’m not able to describe, and is available from May to July. My aim with this blog is not only to try and turn those not-so-liked fruits and vegetables into dishes that people will enjoy but also to educate people about the health benefits of local and seasonal foods that one should be consuming to give their immune systems a good and natural boost. In this recipe I have used only natural ingredients. There’s no processed foods or sugar, and as a result it’s a very healthy and low-calorie option to beat the heat and also get some nutritional goodness into you. Most of my family members and some friends liked the frozen yoghurt but there will also be those who don’t like it simply because they don’t like the fruit. Try it and see how you do. 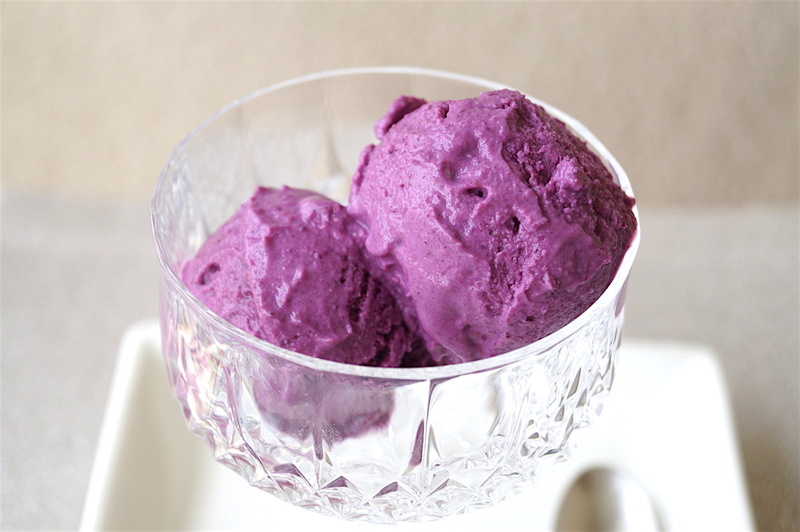 It is super healthy and has the most glorious purple colour. I’ve kept it very simple here but one can also experiment with a bunch of spices and aromatics. Go for it. Remove the flesh of the jamun from the seed. The weight of the flesh without the seeds should be 400 gms. 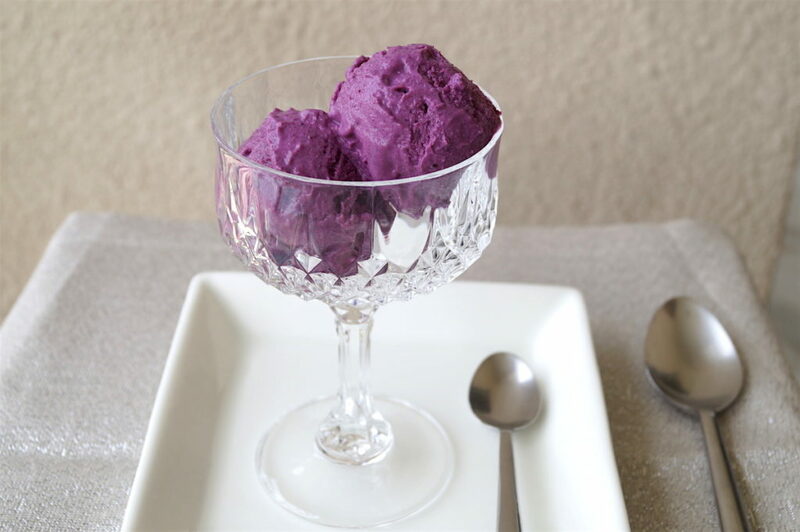 Whack the jamun in the blender till there are absolutely no lumps. 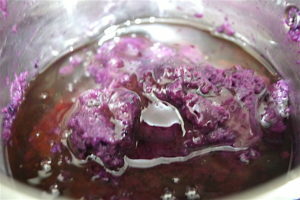 Add the honey and lime juice and blend nicely till you get a lovely smooth purple paste. 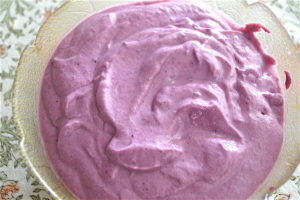 Then add the hung yoghurt and blend more. Taste and see if you would prefer to add a bit more honey or lime juice. Adjust accordingly. Blend again a bit and once you’re satisfied with the taste and pour it out into a clean and dry container appropriate for the deep freeze and freeze for at least 4 hours. Important notes: Pick nice ripe juicy jamun for this, not the dried and semi ripe ones. Do not hang the yoghurt for too long. It should not become too dry. Two hours is enough. 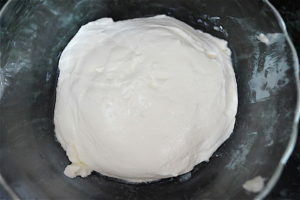 If you feel it’s too dry, add a wee bit of regular yoghurt to make it smooth. 1. Cut the flesh of the jamun from the seed. 3. 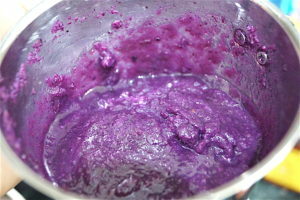 Pulverise the jamun in the blender, then add the honey and lemon and blend more. 4. The result should be this. 5. Add the yoghurt and blend. 6. 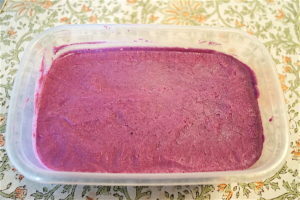 Pour the Jamun mix into a freezable container and freeze for at least 4 hours.